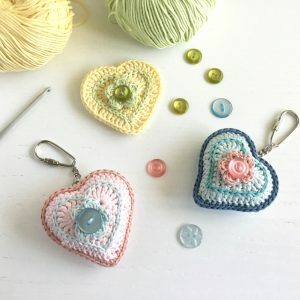 I’ve been brightening up some dull January days with some happy crochet that makes me think of spring to come. I have been sorting out my “studio” (it’s my bedroom) after the stress of the Christmas period and getting ready for the new season. 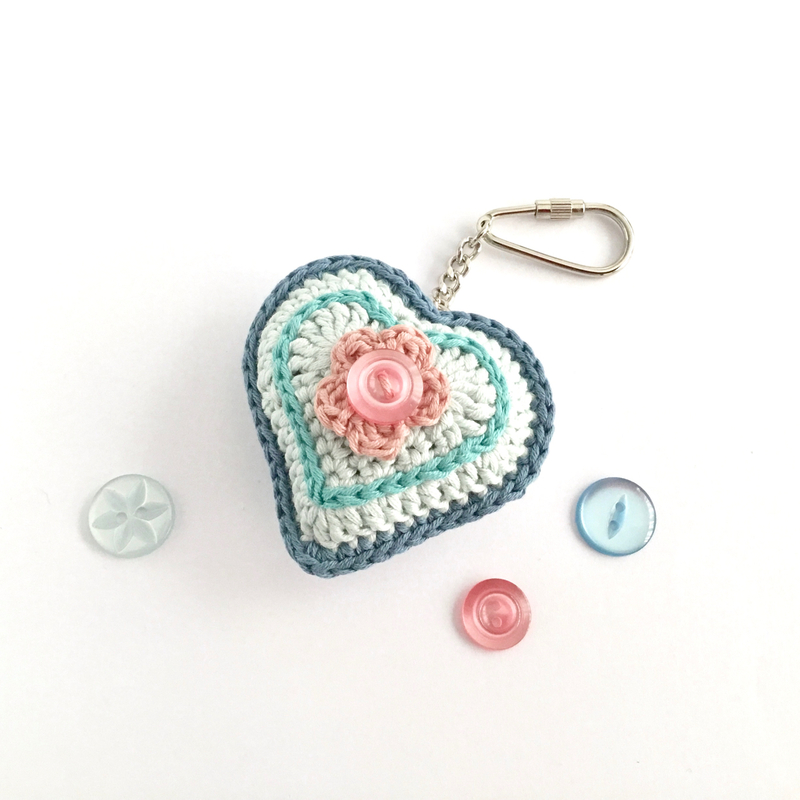 I was sorting through the yarn and vintage buttons I have in stock and there was such a happy coincidence of spring-like colours, I just had to make something. 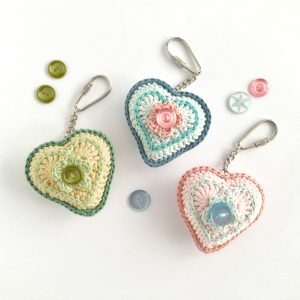 The something became these new crocheted heart key fobs or bag charms, each featuring a vintage button from my collection. 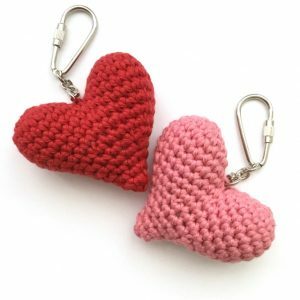 These are made with 100% cotton. 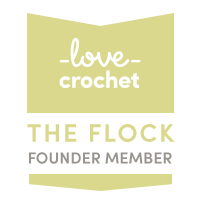 As you know, I prioritise sustainability in my home life and business, and so would not normally buy non-organic cotton yarn. 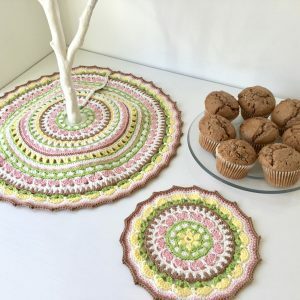 However, occasionally I am sent yarn when I am asked to design for magazines, etc, and there is no way I can throw good yarn away – much better to turn it into something useful. 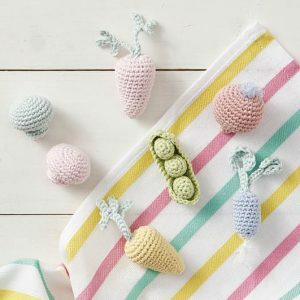 In this case the yarn is left over from designing my miniature vegetables and spring mandala patterns. I’ve made three colour ways: pink, blue and yellow. 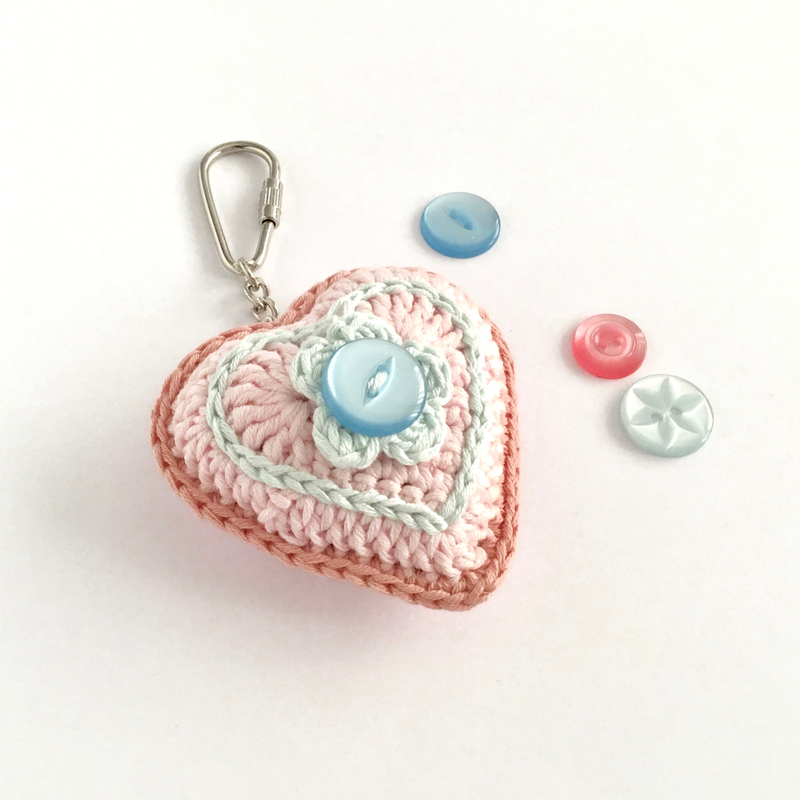 Isn’t it amazing – you would never think that I hadn’t bought the buttons deliberately to match the yarn! Since the number of buttons I have is limited, the number of key fobs I can make exactly like these is also limited. 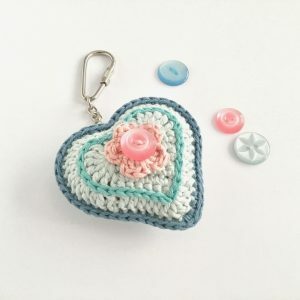 The hearts are 6cm top to tail, not including the key chain. The reverse of the fob is plain in each case. Stuffed as always with 100% natural sheep’s wool. 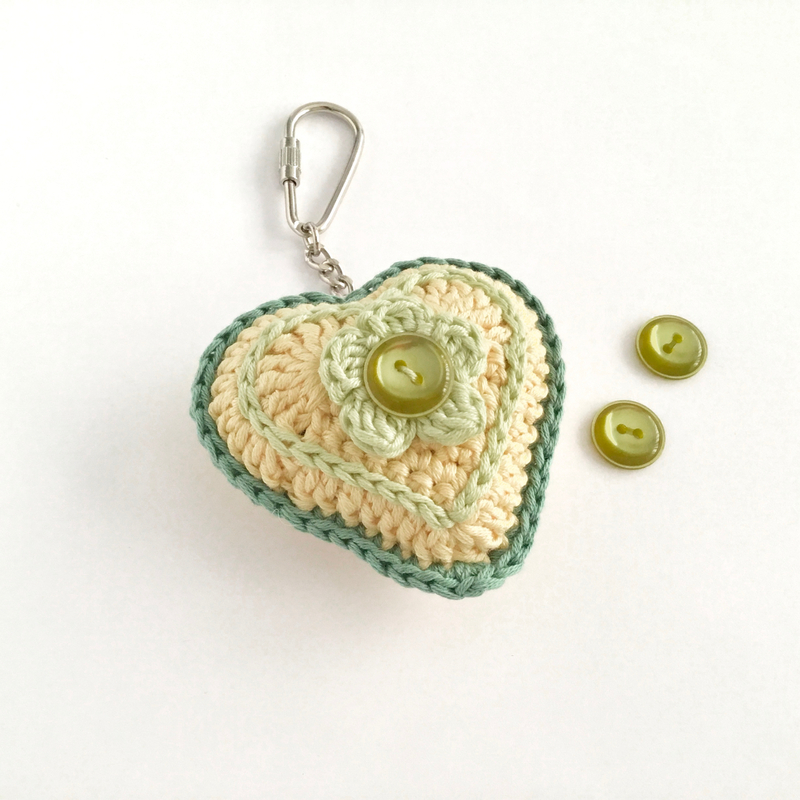 Find these heart key fobs on Etsy now. 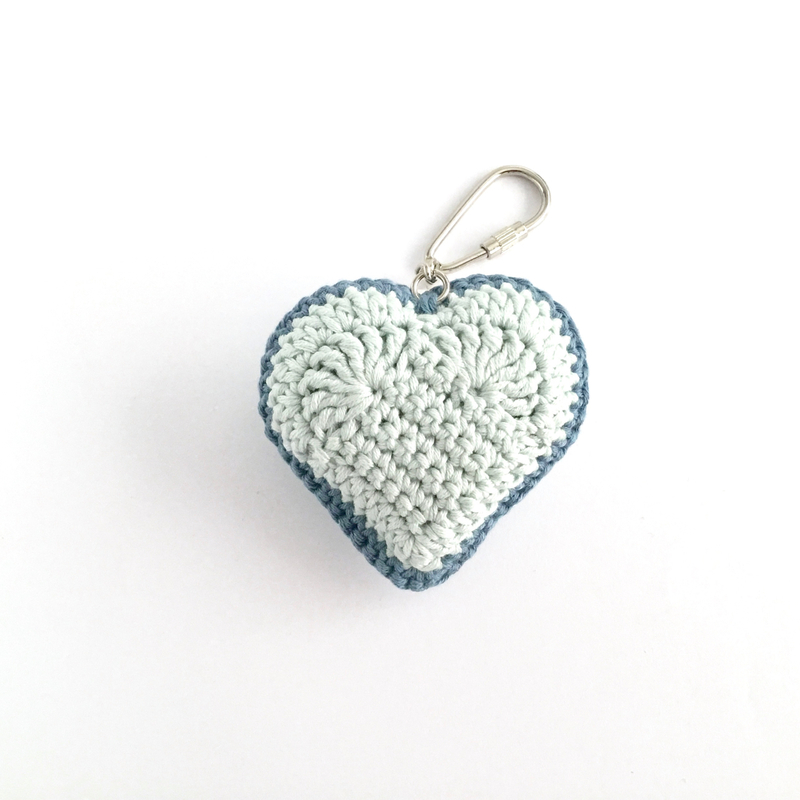 Do ask if you’d like one in different colours – I can probably oblige! My plain heart key fobs in organic cotton are also available in my Etsy shop – I can make these in all manner of colours. Taking photographs is tricky at this time of year, so there are some more little springtime trinkets I have to show you, but I have no photos as yet. Watch this space!